Mosaic, a creation from The Charture Institute, came out of last year’s Tetons 2020 effort, with the final piece featuring 16 essays diving into various aspects of the health of the Teton County region’s ecosystem. The Charture Institute, based out of Jackson Hole, Wyoming, is a think tank focused on growth, change, and sustainability in Places of Ecological and Aesthetic Significance. Invasive species hold the potential to create great environmental and human health issues, and are costly to address. Human behavior is the major factor affecting the introduction and spread of invasive species. 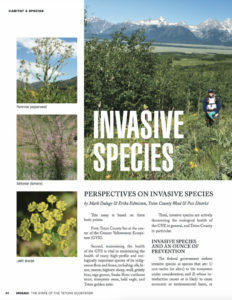 Despite active prevention and treatment efforts, over 24,000 acres in Teton County, Wyoming — roughly one percent of its land — are affected by invasive species. 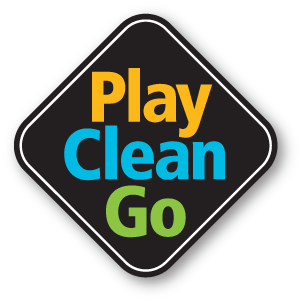 Practice the outdoor ethic of PlayCleanGo – Stop invasive species in your tracks! Pay attention to plants that look out of place and report them. Curiosity is our friend! Do your part! Every landowner in Wyoming is required by State Statute to treat noxious weeds on their land. To view the full 2018 Mosaic, please click here!